Take to the high seas on your own pirate ship as you navigate your way through a watery adventure around Mutiny Bay. Littered throughout the course are all sorts of effects that can be triggered using the on board water cannons. Of course, if you get bored of trying to hit all the targets, you could always turn your cannon on your fellow riders for a full on water battle. The biggest challenge however is to avoid being hit by other pirates on their own ships or any landlubbers who may point their cannons in your direction. Over the years the lake on which Battle Galleons is located has played host to many different attractions - most notably the iconic swan boats, which used to take visitors on a leisurely ride around the lake, allowing a peaceful six minutes away from the madness of the rest of the park. 2004 said the final farewells to the swans, which left after 17 years of service. In their place came the pay-per-play attraction, Splash Kart Challenge, which couldn't have been more different to the tranquil Swan Boats ride. "Go-karts on water" would not be far from describing the ride. Riders would pay £3 for 2 laps of the course, which was made from floating rubber bumpers. 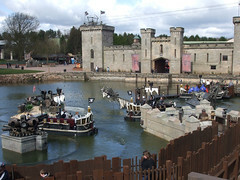 After 3 years of operation and with the retheme of Merrie England underway, the Splash Karts left the park to make way for the Battle Galleons that opened in 2008 as part of the new Mutiny Bay. The attraction was the most impressive of the new pirate additions and looks at home in the lake in front of the courtyard. Over the years the rather moist nature of the ride means it is not the most popular ride for much of the year and often opens later then the rest of the park. Originally the ride had an on ride photo facility but this was removed for the 2015 season.